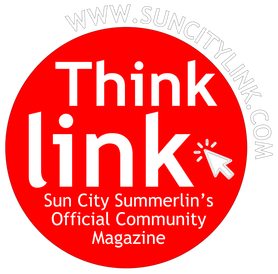 Welcome to the Link’s redesigned website and new way of covering Sun City. Over the past several months, the Link formed a sub-committee of its editorial board members to brainstorm ways to expand coverage, consolidate the current site, offer added exposure for advertisers and provide a key word search option. HOME PAGE – The first thing you’ll notice is how we’ve re-created the feel of the magazine. On the left side of the screen is the full-size rendering of the cover photo. Our photographers put so much effort into their cover photos that we wanted to create a gallery space to spotlight their work. The key to navigating the site will be what insiders call the “hamburger” or box menu adjacent to Table of Contents (located at the top left of the screen). By clicking on the hamburger, you will be able to turn the pages to read what’s going on in the About Us, Community, Classifieds, Clubs, Club Calendar, Advertisers and Archive sections. On the right side of the screen you’ll notice our Top Picks of the Week. This is our way of helping you fill out your weekly calendar. Selections will not always be event based, because sometimes the best thing to do on a Sunday morning is grab a smoothie at The Summit Snack Bar and head to the patio and enjoy the view. However, we’ll work with club members to help them promote their exciting programs, as well as with Association departments to make sure you know when it’s time to head to the health fair or sign up for a free golf clinic at Eagle Crest. ABOUT US – This page offers the website’s mission statement, introduces readers to the staff and volunteers, and instructs you how to get in touch with us if you’d like to share an idea/opinion. COMMUNITY– This page combines the home and community tabs of the previous site to offer the coverage of community events, as well as information on upcoming events. CLASSIFIEDS – This is our marketplace, and where you’ll find items offered up for sale by residents. The weekly estate sales also will be located here. Addresses and the upcoming day/s of the sales will be listed at the top of the page, starting Thursday afternoon. CLUBS – This section will feature bi-weekly video spotlights of Sun City clubs on a Youtube channel, where videos will be archived and have a shareable feature so you can forward activities to your friends and family. The page also will feature a club directory with contact information for club presidents, as well as a live link to club websites. CLUB CALENDAR – This latest and greatest feature of the website will allow clubs to post their monthly club meetings and cancellation notices on one centrally located calendar. In the coming months, the Link will work with the Residents’ Forum and the Computer Club to help club presidents learn how to get the most out of this powerful communication tool. Stay tuned for information on workshop dates. ADVERTISERS – Get to know the advertisers in their own words and learn why Sun City residents are so important to them. ARCHIVE – Looking for a past story? Not only does the archive contain a PDF of each magazine dating back four years, but it features a search menu that can help you locate a variety of information via a key word search. ANALYTICS – Behind the scenes, we’ll be able to track data and analyze what you’re doing to see what sections you like and which ones we can say sounded like a good idea at the time. That’s about it. We hope you like what you see and that you’ll take some time to explore the changes. Most importantly, we hope you reach out to us and let us know what you think. And if you’d like to help us cover the community, we’d love to hear that, too. Plan to attend the Community Preparedness (CPC) / Neighborhood Watch Committee meeting, Wednesday, June 21, 9 a.m., in the Desert Vista Committee Room. The committee has replenished its supply of Watchful Walkers bracelets and K-9 Corps dog tags. Volunteers are invited to get free bracelets, dog tags and Neighborhood Watch informational material. Meetings are open to all Sun City residents. Stop by for conversation, coffee and donuts. Residents are invited to sit in and listen as editorial committee members discuss ideas for upcoming issues, the website redesign; tackle advertising questions; and share plans to improve community coverage. Guests may ask questions and make suggestions. Attending the meeting is a great way to see the committee in action and decide if you would like to participate in growing the magazine's coverage of activities, residents and more. This is a working meeting that begins at 9 a.m. and runs 'til around 11 a.m. 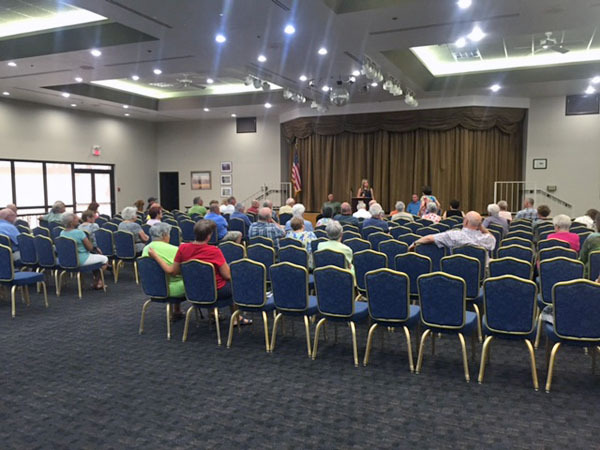 Roughly 60 Sun City residents and six SCSCAI Board members met with Las Vegas City Councilman Stavros Anthony and City Traffic Engineer Gena Kendall on June 15 to listen to feedback and share their opinions on the test speed cushion the city installed on Button Willow Drive as a measure to combat speeding in Sun City. The meeting marked the end of the 30-day test period for the cushion, where residents were encouraged to contact Anthony and Kendall to share their viewpoints. Councilman Anthony reported that his office received an overwhelming negative response to the speed cushions. Calls, emails and conversations, especially among Sun City Board members, clearly indicated that the appropriate decision was to not use the speed cushions as the solution to the community's speeding issue. The councilman then introduced the city traffic engineer, whose office worked on the project. Her response echoed Anthony’s as far as how residents contacted her to say that they did not like the idea of the speed cushions. She further explained how the city went about working on a solution to meet the calls for help regarding community speeding. Data retrieved from the 30-day project linked speeding to local traffic and not to outside motorists who might use the community as a cut-through. Daily traffic volumes ranged from 300 to 700 cars per day, depending on location, with 15 percent of automobiles traveling in excess of 50 mph. The speed limit on main thoroughfares is 30 mph, with residential speeds maxed at 25 mph. As one subject led to another, solutions to Sun City’s speeding issue included everything from adding more community stop signs to requesting that Metro start writing more tickets. In the end, Kendall explained that SCSCAI had purchased two electronic speed monitoring signs that the city will install and service along Villa Ridge and Button Willow drives. The signs, Kendall said, are generally effective in slowing drivers down, but the effect is not long lasting. And so, the onus remains with residents to adhere to posted speed limit signs. One definite that emerged from the meeting was the commitment between residents and the city to continue to work together to find ways to make Sun City safer. 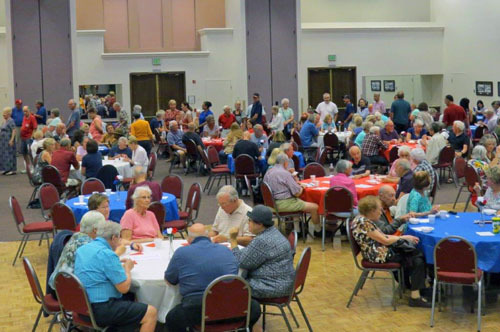 More than 200 residents and their guests met up with friends and neighbors to enjoy a good old-fashioned ice cream sundae during the Residents’ Forum on June 14. And what goes better with ice cream than down-home music and a sing-along. 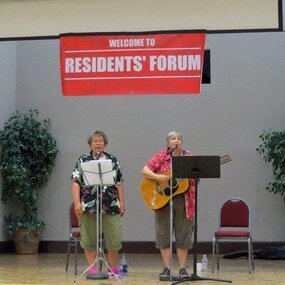 Entertainment was provided by Nan Stevenson and Cynthia Zegers. while enjoying the community's pools. Be sure to cover up with sunscreen/hats, etc. while enjoying time out in the sun this summer.